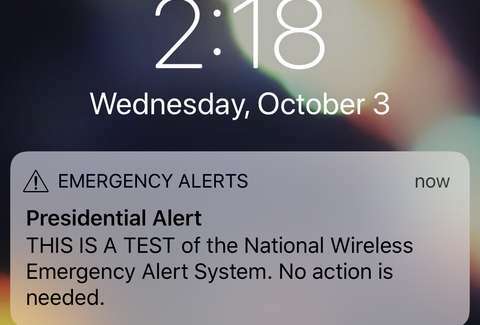 If you, like hundreds of millions of other Americans with a cell phone, received a weird and alarmingly loud Presidential Alert message at 2:18pm ET on Wednesday, you may have wondered why the heck the president is texting you. The answer, as it turns out, is to test out a new nationwide alert system that could theoretically be used to address a countrywide crisis down the road. And since it's 2018, that means plenty took to social media to vent their thoughts, frustrations, and of course, riff on a newly minted meme. Wow! Just tested the #PresidentialAlert system. Very promising method of communication and will help eliminate the Fake News Media. Will soon be sending out my thoughts on the new film, A Star Is Born. Looks great! God Bless the U.S.A! That #PresidentialAlert was definitely even worse than when U2 put themselves on my phone. How do I sign up for emergency FaceTimes from Elizabeth Warren? In tumultuous times like these, it's nice to know we can all still come together once and a while to laugh at new memes.